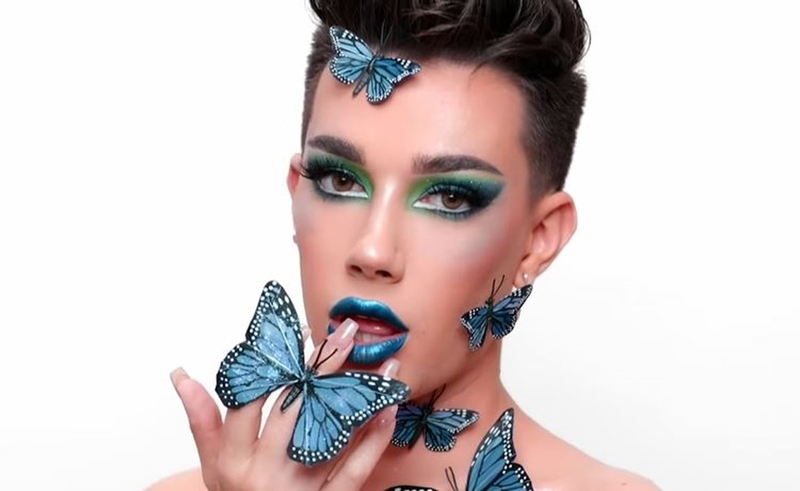 As he inches ever closer to 10 million subscribers, 19-year-old James Charles — who headlines one of the fastest-growing beauty channels on YouTube — is the latest celeb to lend his name to a product collaboration with cosmetics brand Morphe. Launching next Tuesday on Morphe’s website and rolling out to all Ulta stores on Nov. 16, The Sister Collection — ‘sisters’ is what Charles calls his legions of fans — comprises an eyeshadow palette and a brush set. The eponymous palette is priced at $39 and comprises 39 bold shades that Charles says are intended for minimalist makeup wearers as well as those who prefer more of an experimental glam. The brush set comprises 34 tools and is priced at $149. Fans can also purchase the Sister Collection in its entirety — including the palette and brush set — for $188. Charles unveiled the collaboration, which has been in the works for roughly a year, in a YouTube video on Friday (below), featuring a self-produced commercial in which he shows off his singing skills and creates a few imaginative looks using the products. The tagline of the commercial is also engraved into the palette packaging: “Unleash your inner artist” — which is a fitting message given that Charles prides himself in harnessing makeup as an art form, he says, rather than churning out the same staid tutorials frequented by competing beauty vloggers. Charles is far from the first vlogger to team up with Morphe, which has risen to renown by teaming up with YouTube’s biggest influencers. The company also notably operates an affiliate program whereby select creators can earn a percentage of sales if viewers buy Morphe products using their discount codes. Fellow beauty vlogger Nikita Dragun fronted a lipstick collection for the brand in May, though Morhpe is perhaps most synonymous with OG beauty vlogger Jaclyn Hill, who has released several blockbuster products with the company over the years, including The Jaclyn Hill Eyeshadow Palette.